If you have persistent metallic taste in your mouth, it is likely caused by medications, chemotherapy, radiation or certain health conditions. MetaQil® can help relieve the symptoms of metallic taste and make your mouth feel refreshed and normal again. Metallic taste is a taste disorder known medically as dysgeusia. Metallic taste can develop suddenly or over longer periods of time. Those who are affected often describe the condition as having persistent metal, rancid, sour or bitter taste in the mouth. This sensation is not affected by the flavors of foods. In fact, it can produce quite the opposite effect, making even your favorite meals taste unpleasant. This may cause loss of appetite, interfere with eating habits and, in turn, cause inadequate nutrient intake. We have developed a simple solution that is designed to relieve the symptoms of unpleasant taste alterations. 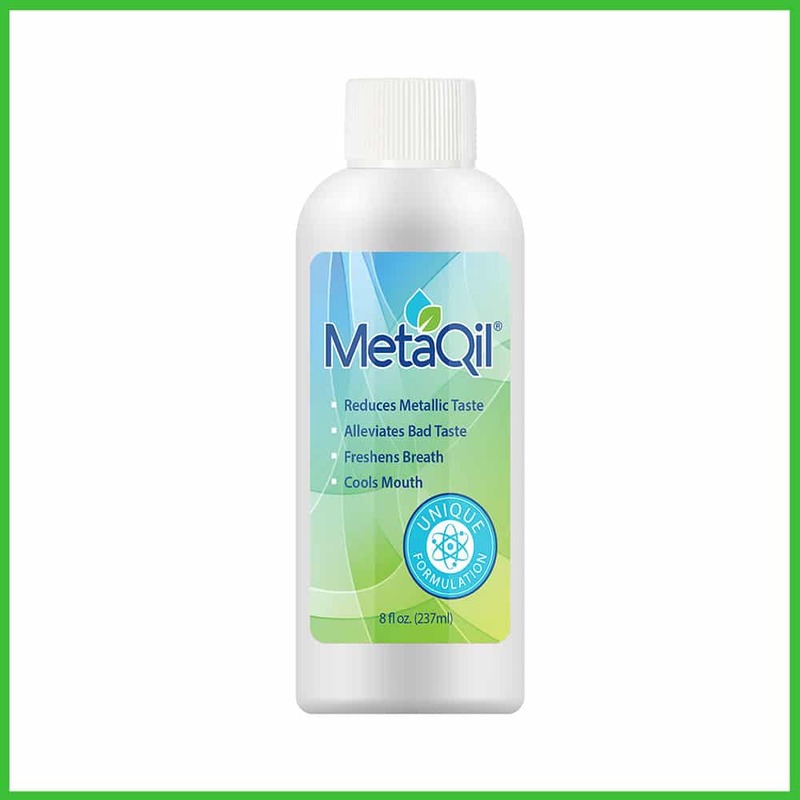 MetaQil® is an oral rinse that gently alleviates any unusual taste in the mouth and restores normal sense of taste. 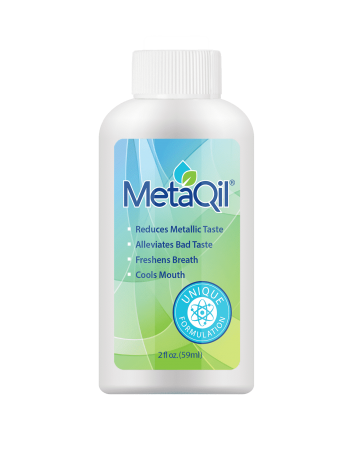 MetaQil has a very mild flavor and does not burn the mouth like typical mouthwash. 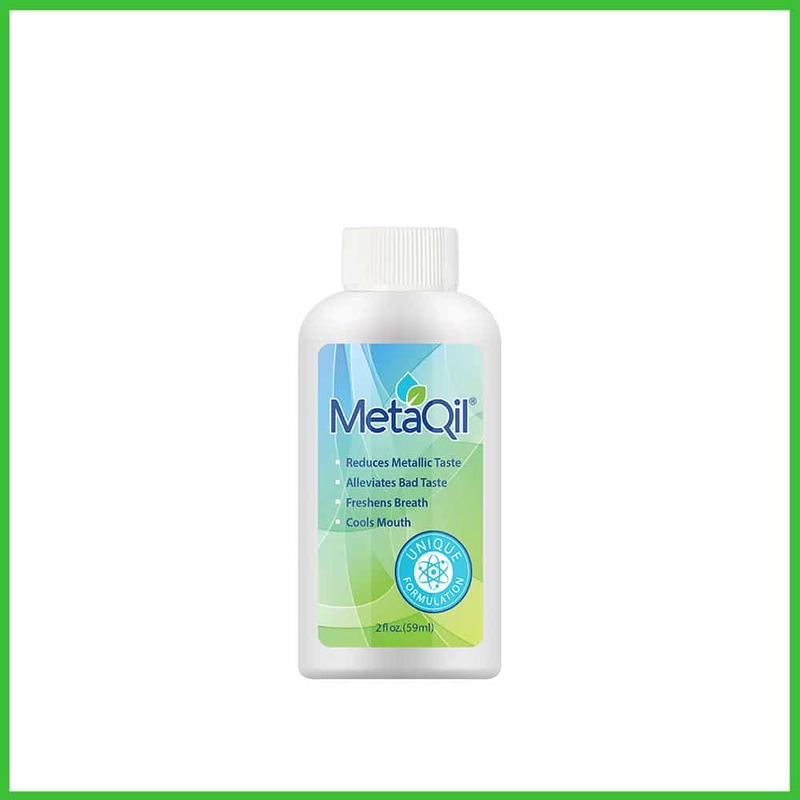 MetaQil can be applied as needed, and because there is no need to swallow, it will not upset your stomach. If you’ve had enough of constant bad taste in your mouth, give MetaQil a try! Contains water, essential oils, xylitol, Vitamin E and other GRAS-listed ingredients. See full list of them here. Currently, MetaQil is the only product on the market designed specifically for metallic taste (dysgeusia) relief. 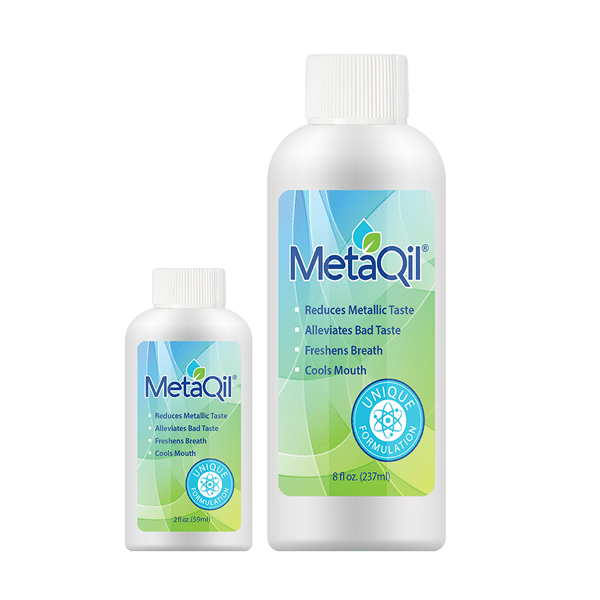 MetaQil can be purchased in a 2oz bottle that is easy to carry in a pocket or take along on a plane. My mom is terminally ill and couldn't eat due to the metallic taste in her mouth. As I was searching the internet looking for some foods that she would be able to maybe taste, I came across this product! After reading about it, I decided to order her a bottle. Needless to say, my mom has been able to eat the past two days because of Metaqil!!! I highly recommend this to anyone that is having the same problem with their taste! Both bottle sizes are available on Amazon.com! 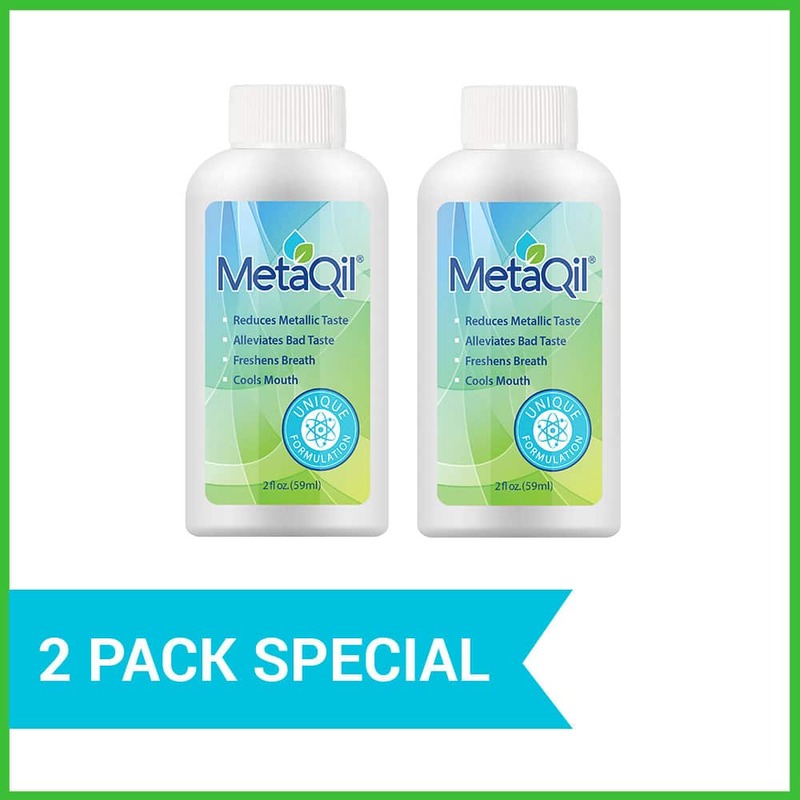 Get MetaQil in two days if you are an Amazon Prime member. IMPORTANT: MetaQil® Oral Rinse is not intended to diagnose, treat, cure or prevent any disease. Do not use Metaqil if you are pregnant, nursing or are allergic to any of the ingredients. Do not apply Metaqil if you have any medical condition that might come into conflict with this product. Please consult your doctor for a medical opinion if you have any concern regarding the use of this product. Keep out of reach of children. We only send good stuff to our subscribers, like discount offers, exclusive deals, and interesting updates. Get your first coupon code right away by signing up below. Thank you for subscribing to our newsletter! Check your email and start enjoying your benefits!